Meanwhile, in 3-quart nonstick saucepan, melt butter over low heat. Stir in flour, salt, mustard and pepper. Cook over low heat 20 seconds, stirring constantly, until butter is absorbed. Remove from heat; gradually beat in half-and-half with wire whisk. Heat to boiling over medium heat, stirring constantly. Boil and stir 1 minute. Stir in cheese until melted. Stir pasta, onions and bell pepper into sauce. Cook, stirring constantly, until hot. 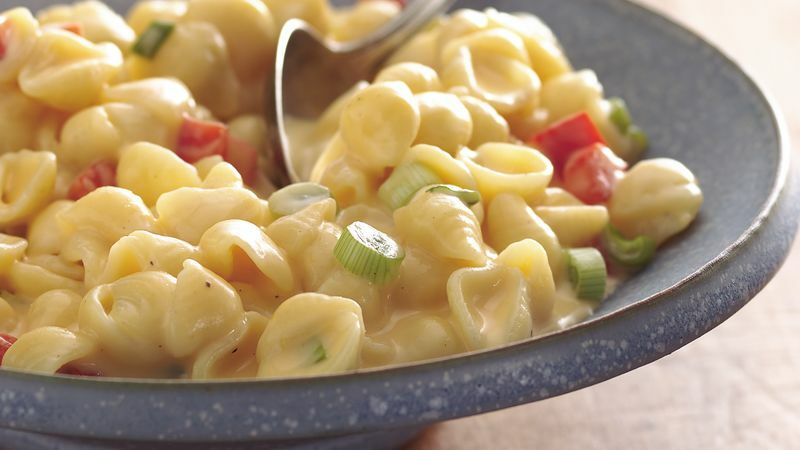 Use Swiss cheese and a dash of ground nutmeg in place of the Cheddar cheese to bring a whole new flavor to this traditional pasta dish. Try one of the many new pasta shapes or flavored pasta in this quick recipe.